When the original Cumberland trail network was developed, it was pretty easy to figure out where to go, and how to return home. A few people had gps’s for their rides, but really it was the smartphone which opened up a lot of options. 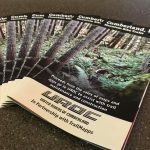 With a combination of Trailmapps : Cumberland and Trailforks.com you can easily find the trails locally and beyond, and if you should be in need of help, they can pinpoint your location for others to find you quickly. Trailforks also includes trails outside of the region covered by the United Riders of Cumberland Land Access Agreement which was signed in the spring of 2016. The primary focus of the official UROC maps are the lands included within the agreement including the Cumberland Community Forest. Following is a quick rundown of the authorized and official maps and apps available. For almost 10 years a simple paper map has been available for purchase at local shops. 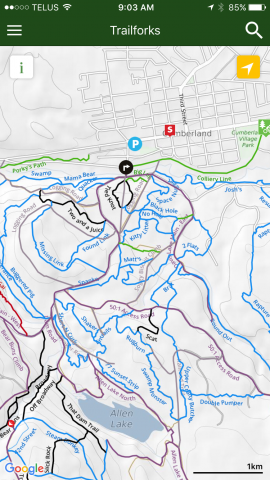 We have updated this map with the completely new artwork seen on the kiosks and in the Trailmapps : Cumberland App seen below. Using Waterproof paper, this map should provide for many fun rides. 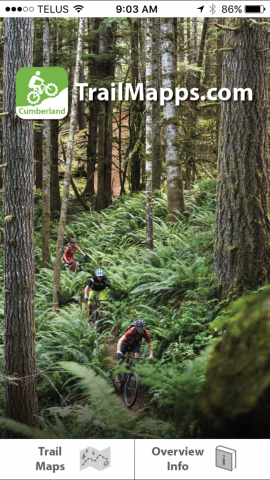 Pick it up at most bike shops, tourist center, accommodations around Cumberland and the Comox Valley. Purchase price is $5.00 and a portion of the proceeds goes back to UROC. 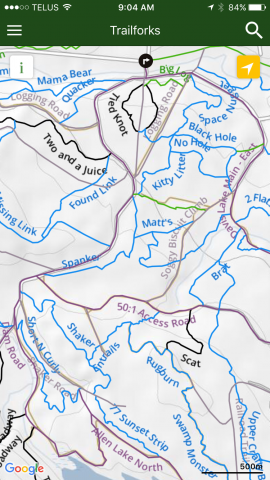 Developed through a group effort of the United Riders of Cumberland, the Village of Cumberland and the forest land managers, this app is a digital version of the paper map and kiosk maps seen around the Cumberland trail network. Find it in the iOS AppStore and on Google Play, priced at $9.99 it gives you lifetime updates and the cleanest user experience. 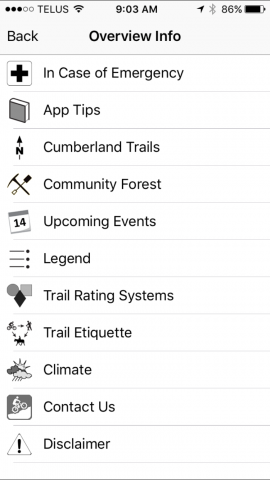 A portion of the funds from the purchase of the Trailmapps : Cumberland app go directly to UROC. 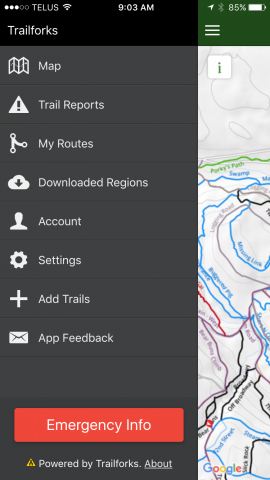 A few features in the app vs the paper map are seeing your location overlaid on the map, trail descriptions, trail profiles and suggested routes. Produced by Pinkbike.com this worldwide map app gives you the local trails and those beyond. It’s free to download, and there is a Karma button to donate to the local trails. 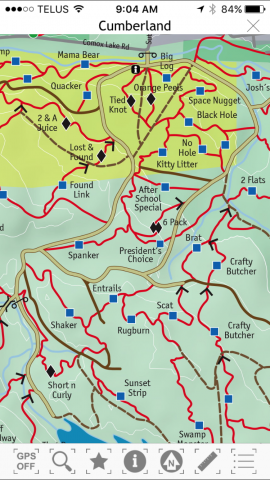 As Trailforks was designed for a larger scale, we recommend the Trailmapps to supplement for the Cumberland trails. Both of the apps listed above provide the benefit of showing your location on the map. Additionally there is a screen which will show your actual location on the map. 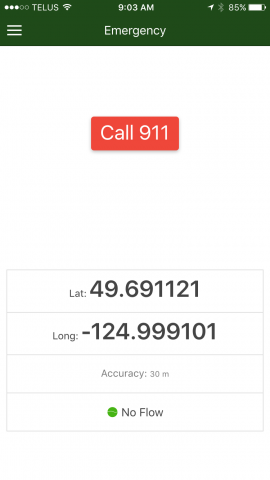 From the main screen, click “Overview Info”, then “In Case of Emergency” and then “Get Coordinates” to find your location. 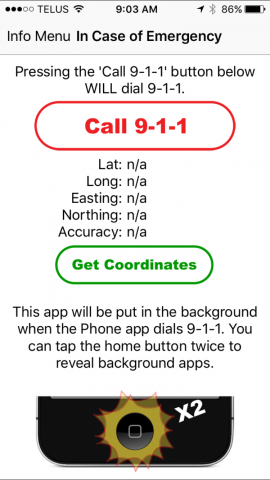 Select the menu via the four horizontal lines, “Emergency Info”, then wait for the GPS to locate you with (the smaller the accuracy the better – anything under 75 will be close enough). Please note, the trail listed is the nearest possible trail, but a bug means it may be quite far from your actual location. Update coming soon.